Add egg, vanilla and food coloring and combine. Mix flour, cocoa powder, salt, and cinnamon together and set aside. Alternate adding buttermilk and flour mixture to wet ingredients until combined. 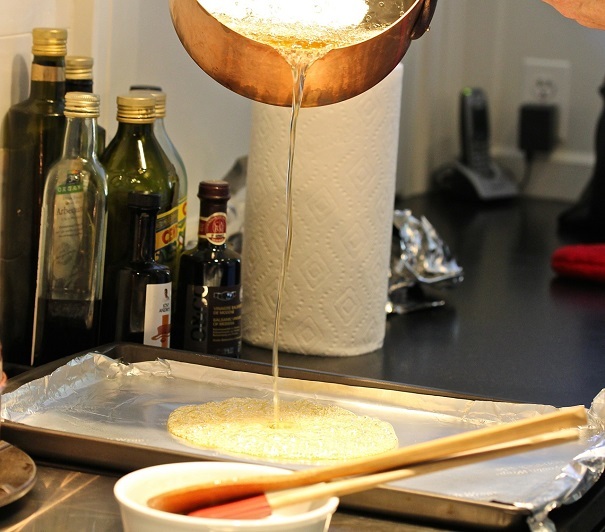 Combine vinegar and baking soda, and add to batter. Beat until smooth. Put 12 cupcakes liners in a cupcake tin. Fill to ¾ full and bake for 20 minutes at 350 degrees. 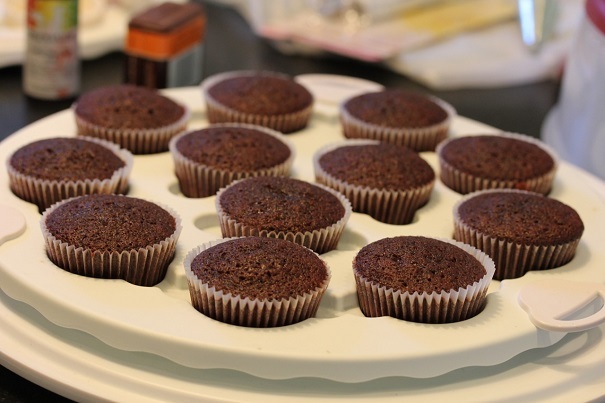 If you are using foil cupcake liners, bake for 17 minutes. Place on wire rack to cool. Put butter and cream cheese in a mixer and beat at medium high speed for 5 minutes. Reduce speed to low and add powdered sugar, a ½ cup at a time until is it completely mixed in. Add vanilla and cinnamon and beat at high speed two minutes. Cupcakes are best if eaten within 24 hours of baking. 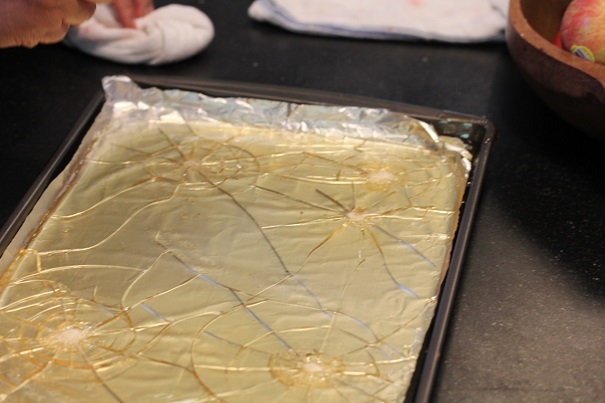 Line a baking sheet with foil or parchment paper and spray with cooking spray. Heat sugar and water, until sugar is dissolved and boiling. 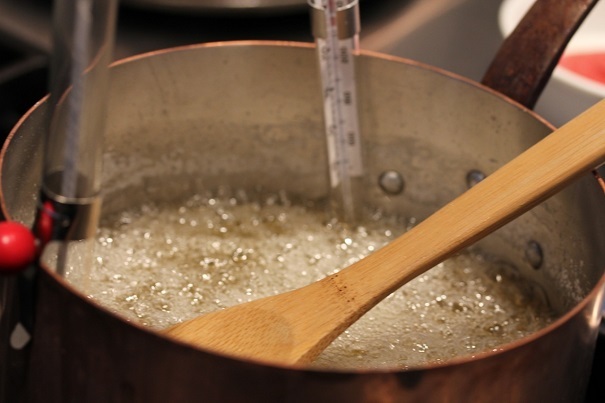 When sugar mixture is dissolved and boiling, add corn syrup and cream of tartar to sugar and water. This will reduce the heat, so stir gently in the middle of the pot, allowing the heat to get to 300 degrees, which will take 15-20 minutes. Mixture will thicken. Do not allow sugar to begin to turn brown; that means it is getting too hot. Sugar mixture should be a clear color. When sugar reaches 300 degrees again, pour into baking pan, raising the saucepan to about a foot over the baking sheet as you pour. This is to prevent air bubbles from forming in the candy. Set candy aside and allow to harden. After an hour, take a hammer and break the glass into shards of sugar. Use as garnish on cupcakes. Cook one bag of frozen raspberries and ½ cup of sugar at low temperature until soft. Strain seeds from raspberries with a fine mesh sieve. 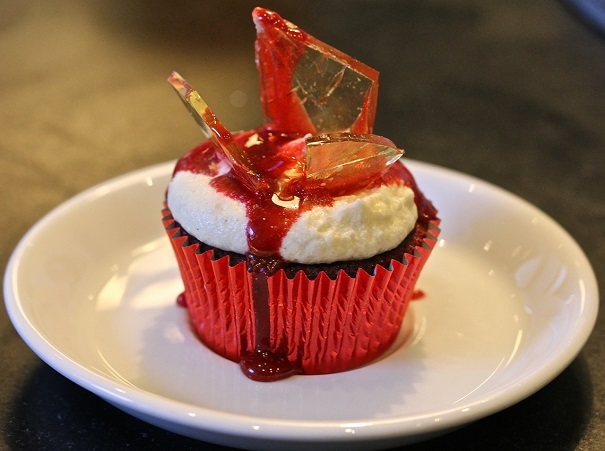 The mixture that’s left can be used for the “blood”, without having to use red food coloring.